ON THE MOVE. When military drones stand still, they become a much easier target for enemies to detect and attack. So keeping the devices on the move is a top priority for the U.S. Army, which is now eyeing a mobile retrieval system that could ensure its drones are never in one place for long. The system is Talon, and the Army got a look at a prototype of it at the Maneuver Center of Excellence (MCoE) at Fort Benning in Georgia on Thursday. NATURE-INSPIRED. Talon is essentially a box with two open ends that sits on the back of a truck. 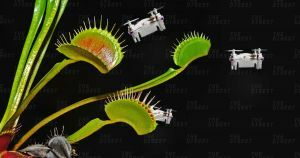 A grid of rods on the floor and ceiling of the box move up and down to trap a drone when it flies into the box through an open end, similar to the way a Venus Flytrap traps its prey. Because the truck is moving during the process, the drone is never actually stationary. Soldiers could launch drones from Talon as well. TESTING TALON. For now, Talon is still a prototype, but its creators, military tech company Target Arm, could submit a proposal to the Army asking for funding to test the system with soldiers, according to Thomas Nelson, director of Robotics Requirements at Fort Benning. If those tests go well, the system could see action on the battlefield where it could help drones go undetected. That would keep soldiers out of harm’s way by allowing them to retrieve and launch the devices without leaving the safety of their vehicles.